The discovery of brain pathology through autopsy in former National Football League (NFL) players called chronic traumatic encephalopathy (CTE) has raised substantial concern among players, medical professionals, and the general public about the impact of repetitive head trauma. Using sophisticated neuroimaging and analytics, researchers have now identified abnormal areas of low blood flow in living professional football players. These findings, published in the Journal of Alzheimer’s Disease, raises the potential for better diagnosis and treatment for persons with football related head trauma. This study used cerebral perfusion imaging with single photon emission computed emission tomography (SPECT) to examine the brains of the largest group of retired and current NFL players investigated to date, a total of 161 individuals with an average age of 52. Looking at blood flow to every region of the brain, researchers were able to identify areas of abnormally low blood flow. Combining this information with a leading-edge quantitative approach called machine learning allowed them to distinguish NFL players with abnormal brain patterns compared to health controls with 92-94% accuracy. 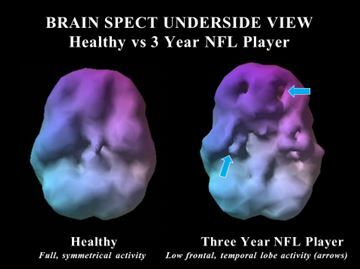 Caption: SPECT brain scans showing abnormal low blood flow in an NFL player compared to a normal healthy control subject. 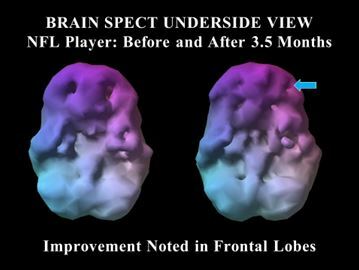 Caption: SPECT brain scans showing improvement of abnormal low blood flow in an NFL player compared after 3.5 months on a customized brain rehabilitation program. Investigators determined that on average the NFL players had lower blood flow in 36 areas of the brain. The decreased blood flow in the following six regions of the brain were the most important in determining who had football related health trauma: anterior superior temporal lobes, rolandic operculum, insula, superior temporal poles, precuneus and, cerebellar vermis. These same regions function in memory, mood, and learning. When damaged, they can produce cognitive and psychiatric problems as evidenced by the fact that 83% of players in this study had memory problems and 29% of them had history of depression. “Perfusion Neuroimaging Abnormalities Alone Distinguish National Football League Players from a Healthy Population,” by Daniel G. Amen, Kristen Willeumier, Bennet Omalu, Andrew Newberg, Cauligi Raghavendra, and Cyrus A. Raji, DOI: 10.3233/JAD-160207, published online ahead of Volume 53, Issue 1 of the Journal of Alzheimer’s Disease, by IOS Press. Full text of the paper is available to credentialed journalists upon request by contacting Daphne Watrin at +31 20 688 3355 or d.watrin@iospress.nl. Journalists who wish to reach the authors for comment should contact Dr. Cyrus Raji, MD, PhD at cyrusraji@gmail.com.